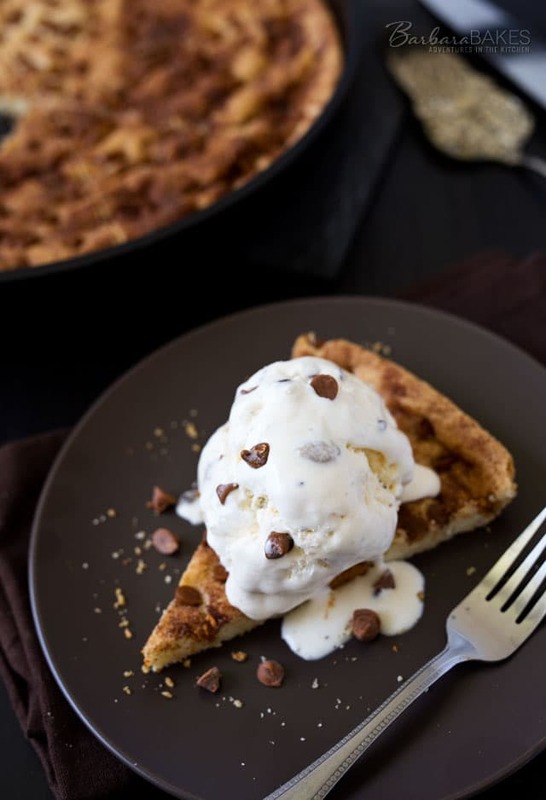 This Snickerdoodle Skookie is a big snickerdoodle cookie studded with cinnamon chips baked in a cast iron skillet served warm with a scoop of vanilla ice cream. Last month when my brother and his family were visiting me, I learned that my nephew is crazy about snickerdoodle cookies. So, of course, I had to bake him my family’s favorite Snickerdoodle cookie, Cinnamon Chip Snickerdoodles. They’re probably the best snickerdoodle cookie ever, and he pretty much devoured them, which definitely made me smile. My sister-in-law joked that she was going to start a blog name Kathy Eats, then I’d mail whatever I’ve baked to Las Vegas, and she’d eat it and say how much she liked it. My husband joked that I should bake and send her a Snickerdoodle Skookie (a skillet cookie). I wasn’t able to get the idea of a Snickerdoodle Skookie off my mind, so I divided the Snickerdoodle cookie recipe in half and created this skookie recipe. 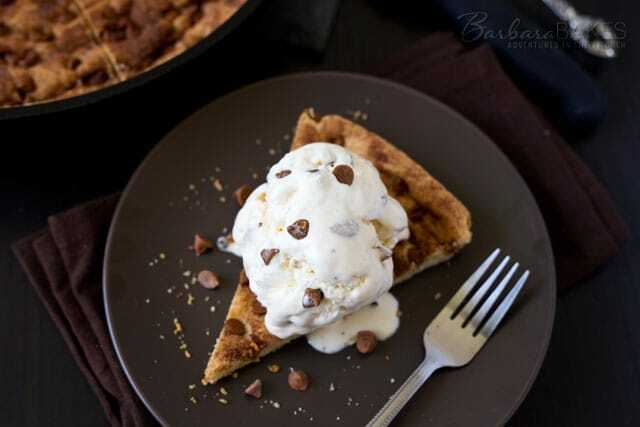 I topped it with some vanilla ice cream and I couldn’t resist adding cinnamon chips to the ice cream as well. I’m pretty sure you could mail a skookie, but unfortunately for Kathy and my nephew, Kathy Eats just isn’t in the cards, and this Snickerdoodle skookie didn’t end up in the mail. Hopefully, they’ll visit again soon and I’ll bake it for them then. Preheat the oven to 350ºF and grease the bottom and sides of a 9-inch cast-iron skillet with butter. In a medium bowl, mix together flour, baking powder, and salt; set aside. In the bowl of an electric mixer on medium speed, cream together the butter and sugar until pale and fluffy, about 3 minutes. Mix in egg. Reduce speed to low; gradually mix in flour mixture. Add in cinnamon chips. 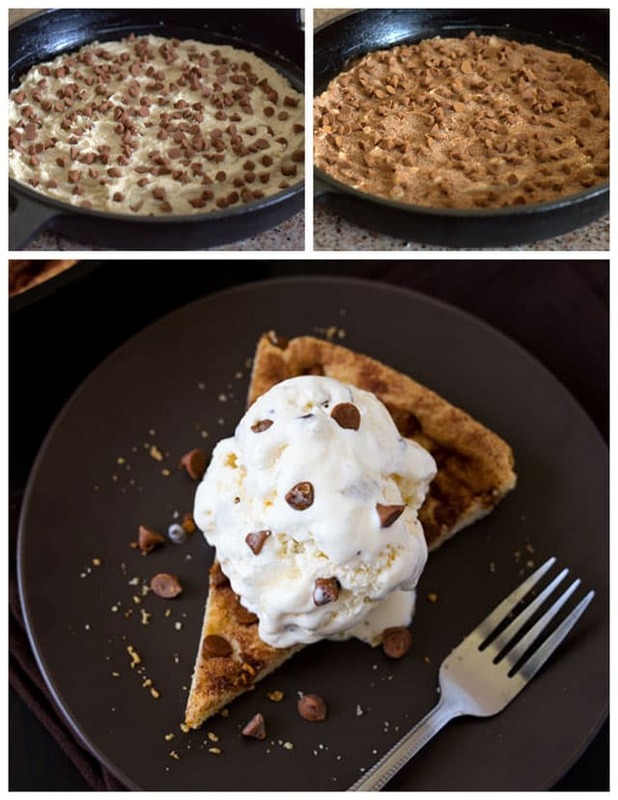 Press the cookie dough into the prepared skillet. Stir together cinnamon and remaining 1 tablespoon sugar in a small bowl. Sprinkle over the top of the dough. Bake for 20 minutes, until the edges are crisp and the center is set. Don't overbake. Serve warm sliced in to wedges. Wow! This looks truly magical Barbara!!! These pictures are killing me. I want to eat it so bad! “Warm with ice cream” – my one true weakness! The Snickerdoodle Skookie looks amazing! Lovely clicks here! i am totally making this for my kids! It’s tough mailing goodies in the mail during the summer. I do it during the Christmas season because everyone wants my pizzelle cookies. Your skookie looks delicious. Pinned. Love this! Especially that scoop of ice cream. Yum!! I laughed when I read your sister-in-law’s brilliant idea. That’s cute. Hey-at least she TRIED to sell you on it. I bet her family was all about it being a swell idea too. Who wouldn’t? Getting mail with your home baked goodies in it? That would be heavenly! Heavenly! I’ll have a slice of that snickerdoodle snookie and a scoop of ice cream, please.